Field-tested with proven results, the First Defense® MK-2 .4% Cone is the first choice, non-lethal defense of law enforcement and tactical professionals everywhere. Featuring a new compact design, this one-ounce canister easily fits into a wide range of OC holsters, pockets and carry bags. Designed to offer the quickest deployment possible, the sprayer employs an enlarged trigger button for quick and convenient activation. A cone-style delivery system disperses a wide spray pattern to deliver optimal coverage at further distances. 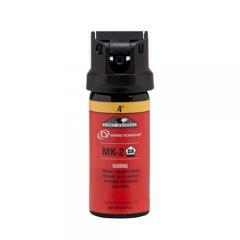 The .4% MC formula instantly inflames attacker's eyes, ears, throat and nose upon contact, causing immediate disorientation and immobilization of the toughest combatants. The canister contains 1-ounce of formula, sufficient for 7-10 bursts with an effective range up to 12 feet.